After making an astounding presence with the St Regis Saadiyat Island, Abu Dhabi, the luxury hotel brand opened their second property, the St Regis Abu Dhabi on the Abu Dhabi Corniche. 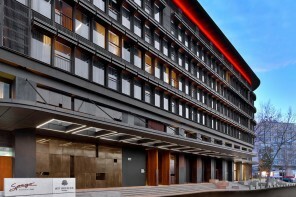 Located in the Nation Towers, the property is a stark contrast to its sister property which is aimed at the leisure market while the new property looks to target the corporate market. 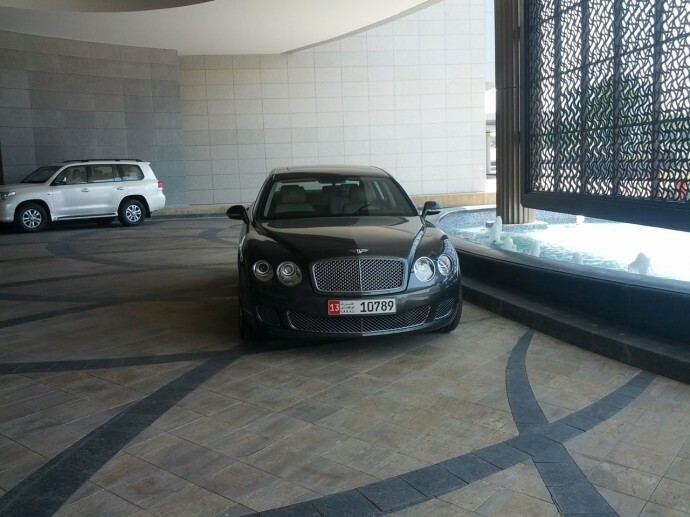 First impressions – We arrived in style in the hotel’s Bentley (available at an additional cost of Dh800 or $217) and were welcomed into the hotel by the doorman in true St Regis style. 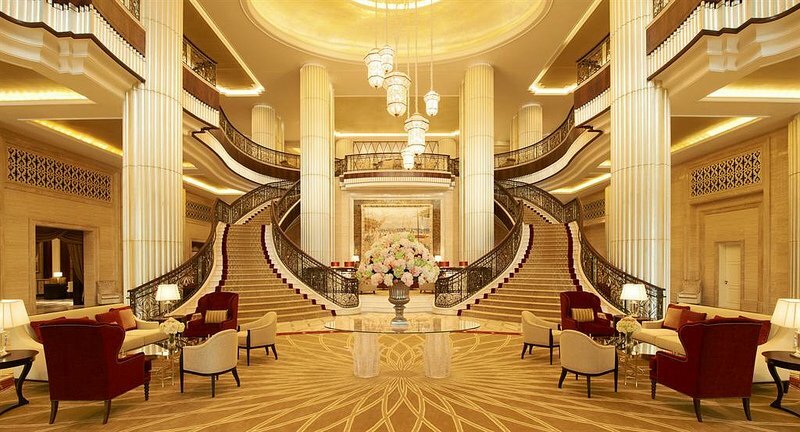 Walking into the hotel lobby, will have you stop short of breath as the four-storey tall lobby with huge low-hanging Arabian lantern-inspired chandeliers and two ornate bronze banister staircases that lead from the floor, instead of the brand’s trademark one grand staircase, sweeping away from each other as they round the twin majestic pillars that frame the lobby Tea Lounge and some cozily tucked reading areas. The motifs on the lobby floor and walls take the shape of a diamond, a favorite of Caroline Astor, the mother of St Regis founder John Jacob Astor IV. Renowned Emirati artist and jewelry designer Azza Al Qubaisi complemented the signature St. Regis diamond pattern with Arabic geometric motifs and flower designs. There is a touch of Arabian culture throughout the lounge, library and other public spaces in The St. Regis Abu Dhabi, including open fireplaces in meeting areas, wooden panels with Arabian geometric motifs adorning the high ceiling, and Arabian-style rugs and cushions. The lobby also carried the signature St Regis secret fragrance and this one had a touch of musk in it. 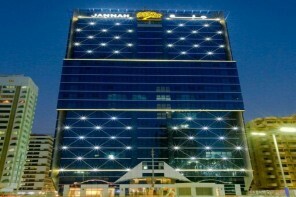 Rooms – The hotel offers 282 guest rooms including 54 suites which are located from the 33rd to the 49th floor. 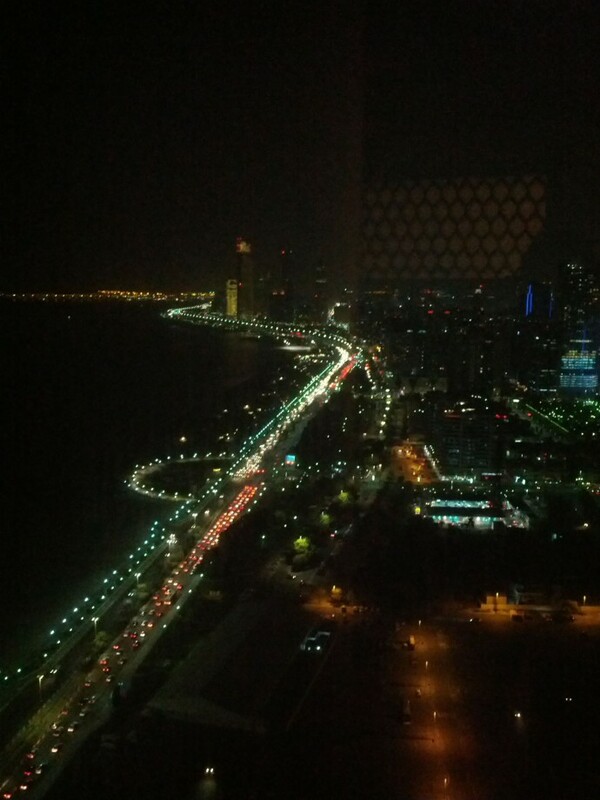 We stayed at the Grand Deluxe Suite, on the 37th floor designed in timeless Arabic elegance. Unlike a standard suite, our suite did not have a separate living room and bedrooms but was spaciously spread over 65 sq m. The suite with its floor-to-ceiling windows offered stellar views of the pristine blue waters of the Arabian Gulf with the Marina Mall along with the Corniche strip and downtown Abu Dhabi. 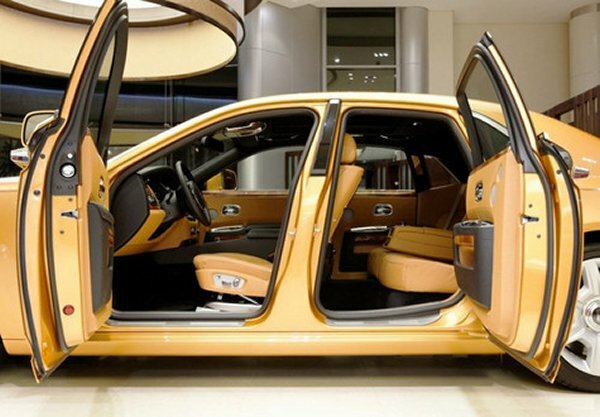 The suite also comes fitted with two 42” flat-screen televisions, a spacious seating area, complimentary Wi-Fi, an iPod docking station as well as a king-size signature St Regis bed. The suite, with its two chandeliers also bears the diamond motif patterns on select furniture and pillows giving it an added elegance. The state-of-the art rooms also featured mood lighting to set the ambiance from romantic to relaxing as well as remote-controlled curtains and drapes. 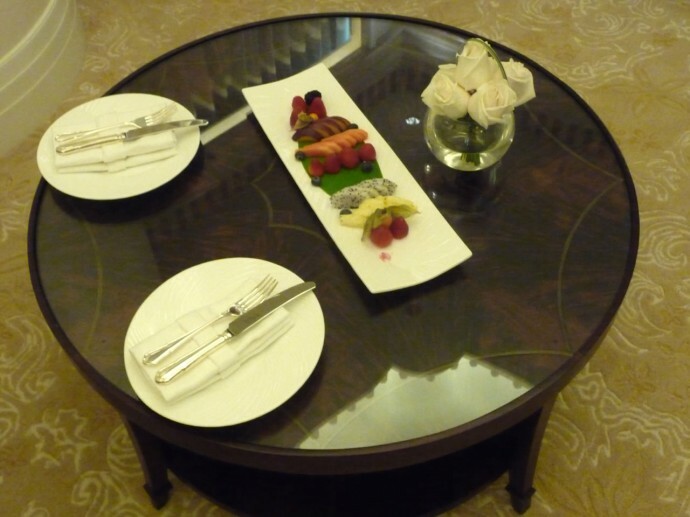 Our check-in formalities were completed in our room by our efficient St Regis butler. Like at its sister property, at the St Regis Abu Dhabi every guest has a butler at his/her disposal 24-hours a day. The butler service, one of the St Regis trademark ensures guests have everything they desire, from packing or unpacking, round the clock complimentary tea / coffee service, to even fixing you a bubble bath. 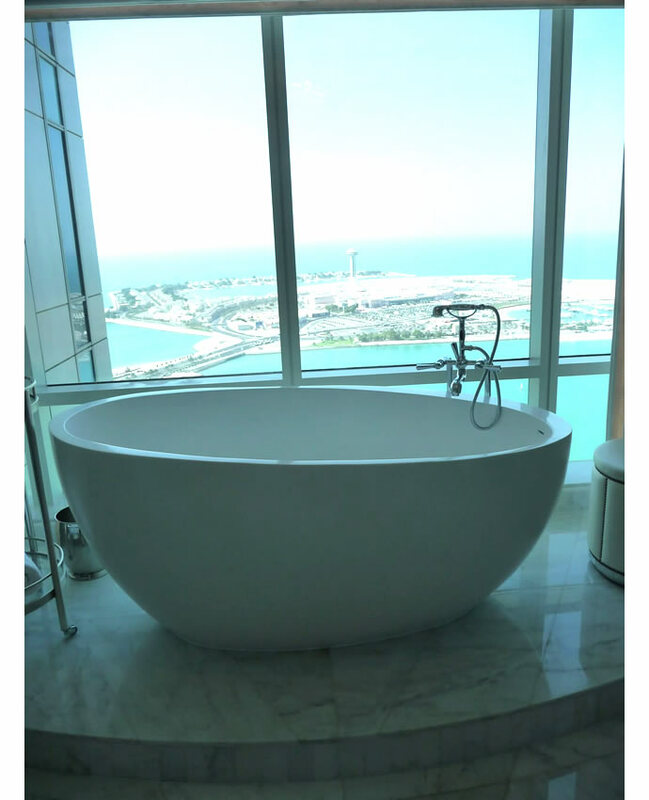 The suite bathroom comes fitted with a chandelier and Statuario Royal marble, and a free-standing bathtub that offers unobstructed views of the Arabian Gulf and the Breakwater island. A separate shower with rain showerhead, Remède bath amenities and mirror-integrated flat screen television are also available. We were greeted with a complimentary fruit plate on arrival and with a double pack of milk and Jujup chocolates by the bed-side in the evenings. We stayed at the first month of the hotel’s operation and everything still the fresh new smell. 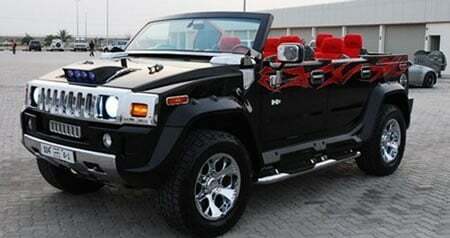 The staff undoubtedly was always ready to help and provide an enjoyable experience to the guests. 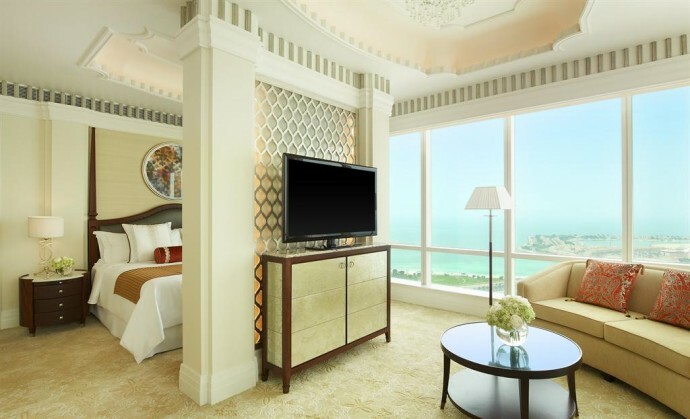 The Grand Deluxe Suites are available to book at Dh1,900 ($520). 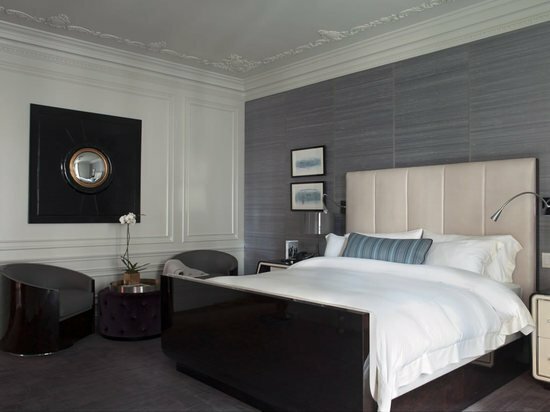 Other room categories available include Superior Rooms, Superior Sea-view Rooms, Junior Suites, the St Regis Suites as well as some niche suites for its connoisseurs. Our stay at the St Regis Abu Dhabi was flawless despite the fact that the property is brand new. Meeting the St Regis standards, the staff expertise was evident and there were absolutely zero hiccups in the quality of service. Leisure – While the St Regis Abu Dhabi has positioned itself as a corporate hotel, there are a number of leisure activities available for both onsite and offsite. The pool is located on the third floor, along with a state-of-the-art health club. The compact outdoor pool is rather pleasant even on a hot, summery day as sits in the shadow of the glistening 50-storey building. 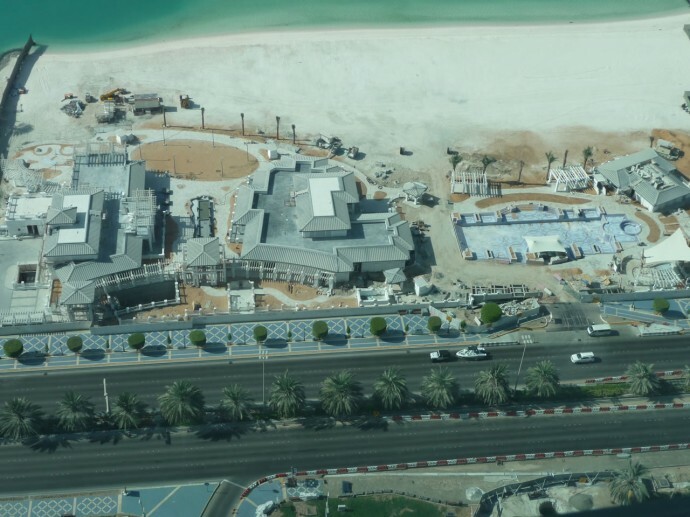 The Nation Riviera Beach Club, which sits across the property, by the beach is the property’s upcoming private beach club which will offer guests private access to the beach, a swimming pool, two restaurants (un-announced yet) and a children’s club – designed like a pirate boat. 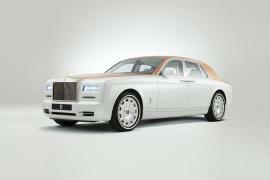 Scheduled to open next year, guests will be escorted from the hotel in true St Regis style in a hotel buggy via an air-conditioned tunnel that connects the hotel to the Corniche. Across the Corniche, bicycles are available on rent, for adults and kids for a little joyride across the Corniche walkway. 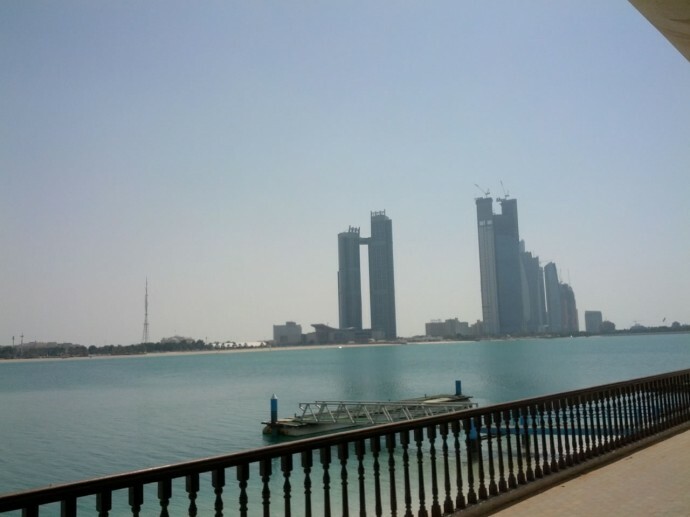 The Corniche is also a great jogging/walking track, if that’s your preferred choice of activity. Spa – The Remède Spa at St Regis Abu Dhabi is the first Remède Spa in the UAE and one of the largest, covering 3,000 sq m. Guests are given a personal consultation to help choose among 25 different facials, massages, body treatments, and spa packages that match their needs and expectations. The Spa boasts of 11 private treatment rooms, each decorated with natural materials and in earth tones with candles that diffuse relaxing aromas, wooden floors and hand-crafted tile mosaics that offer a relaxing feel. The Spa is also the first in the UAE to offer Oxyceutical therapies, where pure oxygen is used in with the treatment for visible results. Another signature treatment is their Four-hand massage, performed by two therapists. The technique combines five different massage styles – Japanese Shiatsu, Thai Massage, Hawiian Lomi Lomi, Swedish and Balinese and is performed using specially-blended aromatherapy massage oils. A paraffin foot cocoon completes this relaxing massage. The massage is priced at Dh975 ($265) for 80 minutes and Dh695 ($189) for 50 minutes. The spa also features a Hommage Gentleman’s Atelier offering several grooming experiences and the Sisters Beauty Lounge for a quick nail or hair treatment. The Spa also features a Spa Café on the outside terrace on the third floor, offering a selection of healthy and refreshing juices and tonics, herbal elixirs, teas and coffees and a nourishing menu. 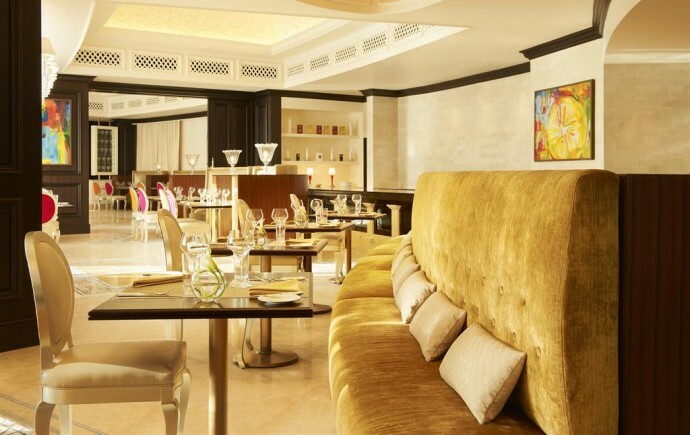 Dining – The St Regis Abu Dhabi is a gastronomical delight for anyone who loves his food. 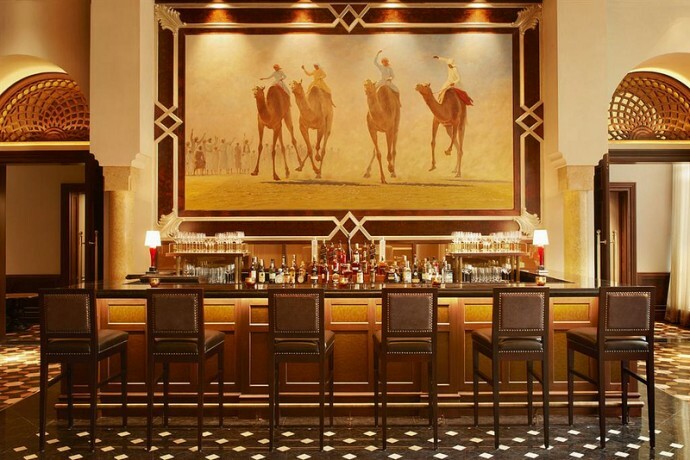 Its trademark St Regis Bar takes a striking resemblance to the classic bar at St Regis New York with spaces in rich walnut, bearing an Arabic touch – namely with pictures depicting Arabic sporting scenes of camel racing, horse racing and falconry. The hotel’s signature cocktail, the St Regis Bloody Mary was first introduced at the original St Regis in New York by Fernand Petiot in 1934. The cocktail is made to perfection by adding salt, pepper, lemon, Tabasco and Worcestershire sauce. A Cigar Lounge is also available for aficionados. 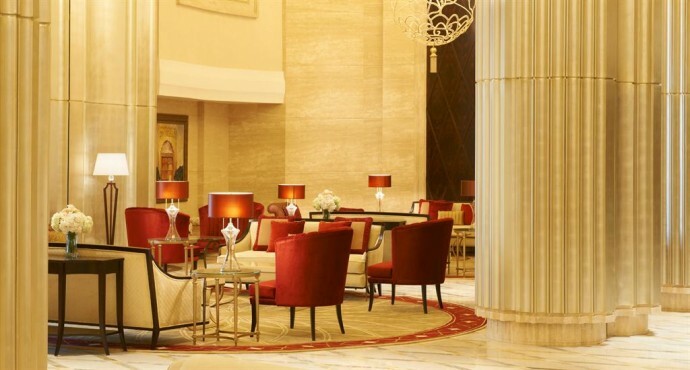 The St Regis Bar has further plans to introduce some special drinks for the ladies as well as some mild cigarettes which can be enjoyed at the cigar lounge. 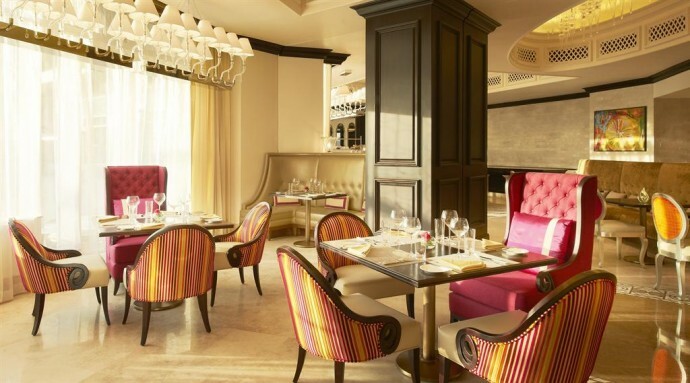 Its crowning glory is Rhodes 44, a restaurant by Michelin-star Gary Rhodes, featuring an exclusive a-la-carte menu with a blend of European and British classics along with Middle Eastern cuisine. Guests can choose to dine inside the bright restaurant or al fresco in a private garden overlooking the Corniche strip. Rhodes has brought to the menu some of his favorites including the Watermelon, Feta and Almond Salad, Pan-Fried Salmon with Flageolet Beans and his British classic, the Sticky Toffee Pudding. The restaurant also serves breakfast, which we were delighted to experience. With choices of both a buffet breakfast and an a la carte menu + Buffet, we chose the Veg Breakfast from the latter (AED 160 – $ 44) and tasted what’d like to believe was the best egg Benedict ever! We also recommend the Mozzarella, Tomato and Basil soup besides digging into a healthy spread of breads, juices and cereals. The restaurant’ a la cart breakfast menu features some excellent choices including a Full English Breakfast, a Full English Breakfast from the Pork Kitchen and options for a Fat-Free and a Vegetarian Breakfast among others. We also dined at the Villa Toscana, a warm Italian restaurant reminiscent of an Italian aristocrat’s Tuscan villa in summer. With a seasonal menu, the restaurant offers some authentic regional cuisine. Devoted to the finest champagnes, the Crystal Lounge is located in the open space on the mezzanine level above the Grand Staircase and features an elegant chandelier of blown glass art, over two storey tall and enhancing its opulent decor. The lounge offers an exquisite range of caviars and other light snacks while the St Regis Champagne Trolley moves table-to-table serving some of the finest champagnes. The Afternoon Tea at the Tea Lounge is a tradition at St Regis. What was introduced in the late 19th century by Lady Astor, continues to remain a timeless tradition at St Regis Abu Dhabi, enhanced by British Chef Gary Rhodes. At tea time guests can choose from twenty-five loose leaf teas from around the globe and a truly remarkable selection of cakes, finger sandwiches, hors d’oeuvres and scones. Meetings – As a corporate hotel the St Regis Abu Dhabi is well suited to cater to all occasions – from business events to state affairs and weddings. 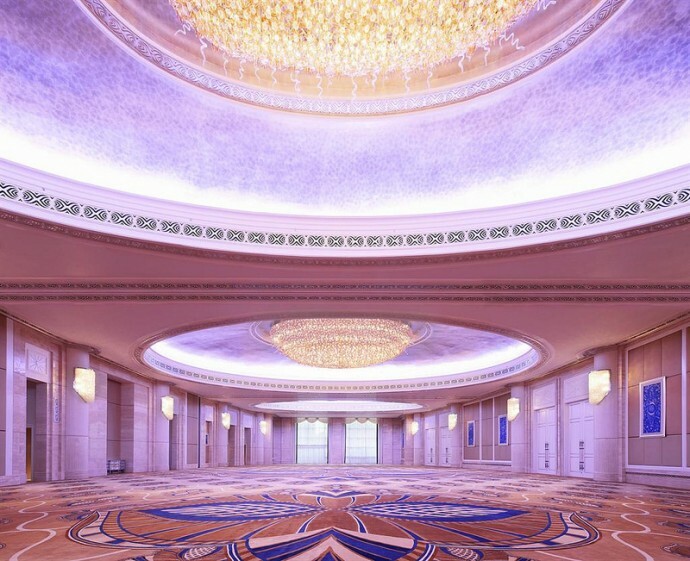 In addition to its majestic 1,300 sq m Al Mudhaif Ballroom, the hotel offers five meeting rooms, each equipped with state-of-the-art audiovisual capabilities, two with fixed boardroom set-ups. The ballroom with its ornate details, handcrafted ceilings, bespoke hand-tufted carpet and crystal chandeliers in the shape of a desert flower is the ideal venue for elegant wedding parties. A dedicated St Regis wedding specialist and the St Regis Butler service will assure an event that flawlessly meets their needs. To splurge – Guests at the St Regis Abu Dhabi can splurge on themselves with a one-of-a-kind Spa treatment – the St Regis Splendour at the Remède Spa. Offering the ultimate spa experience, the package will amaze even the most seasoned spa goers. The experience starts off with a diamond microdermabrasion treatment performed on the face and entire body. Designed to whisk away dry damaged skin while helping to resurface and improve imperfections, uneven pigmentation and stretch marks. This is followed by a relaxing exfoliation of exotic enzymes to further soften, brighten and firm, while warm aromatheutic paraffin is painted over the face and body. The peptide rich body butters ensure that the skin is left feeling like silk while a mask, specific to your needs, accompanied by a vitamin filled oxygen mist ensures your face is left glowing. The treatment ends with a healthy and succulent lunch at the Spa Café, followed by a 50-minute muscle melting warm stone massage. 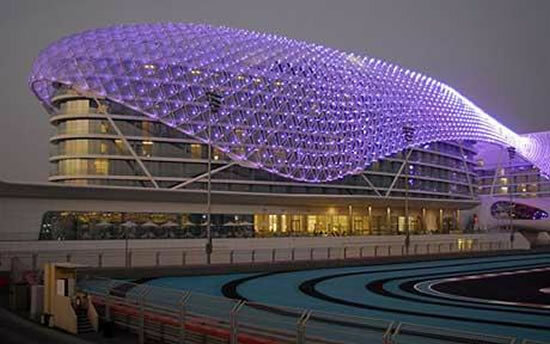 The entire experience lasts four and a half hours and is priced at Dh2,600 ($707). Did you know? 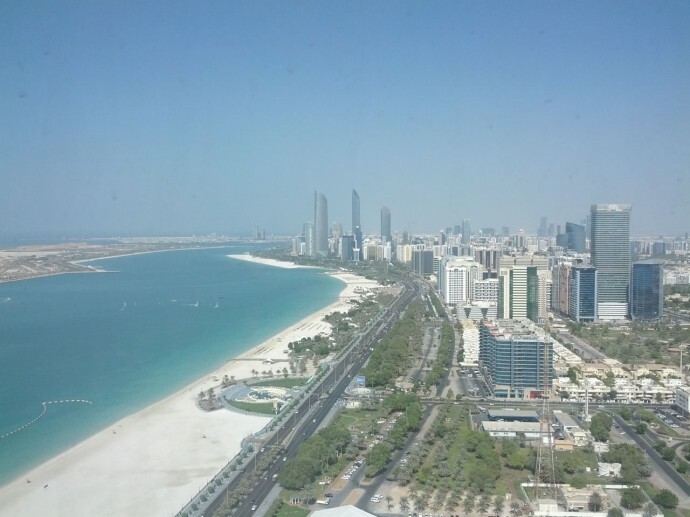 – Sitting on the 49th floor, the hotel’s Abu Dhabi Suite (currently under renovation) is the highest suspended suite in the world. The suite sits in the bridge that connects both the Nation towers. When completed the 1,085 sq m suite will boast of three bedrooms, including a master suite, which includes a private bedroom, library, lounge and dining area. 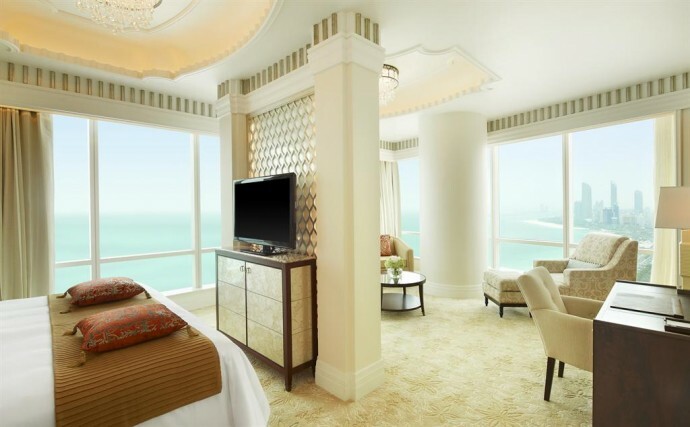 The Abu Dhabi Suite also features a spa, movie theater, kitchen and gym, and comes with private elevator access. The St Regis, Nation towers on the left as seen from Breakwater island. Some striking views from the 37th floor.